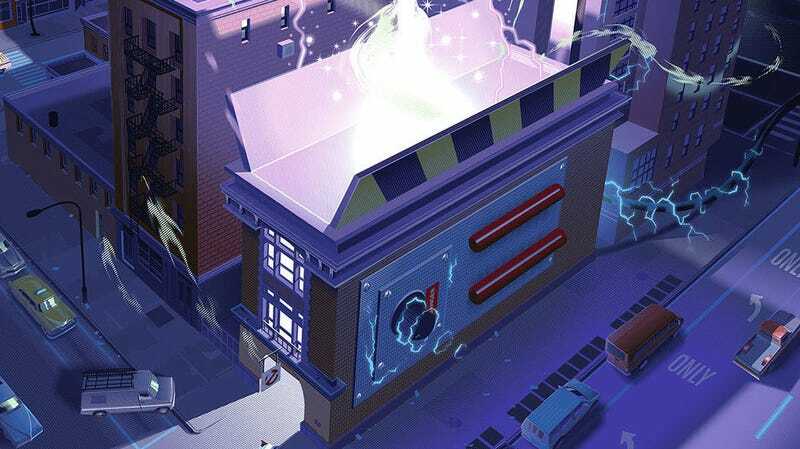 A crop of Laurent Durieux’s Ghostbusters poster from Mondo. And here you go, exclusively revealed by io9. Laurent Durieux’s poster for Ghostbusters, a 24 x 36 inch screenprint in an edition of 375, will first be available at Durieux’s new poster exhibition “The Art of Laurent Durieux Part Two” opening at 7 pm November 9 at the Mondo Gallery, 4115 Guadalupe St. Austin, Texas. It’ll remain on display through November 17. One thing you immediately notice about the poster is that none of the Ghostbusters are on it. At least, not their faces. Durieux said the decision not to put the actor’s faces on the poster was his. Ghostbusters is just one of many posters in the show, many of which have yet to be revealed. But here are a few more. Durieux also did posters for Titanic, Apocalypse Now, Conan the Barbarian, and more. But, out of everything in the show, he said Ghostbusters was probably the most difficult. These posters along, along with the rest of the show, will first be available at the gallery in Texas with leftovers going online for sale in the coming weeks. Follow @MondoNews on Twitter for the heads up.